- Purchase today with no interest for 6 months. Learn More. Are you being taken advantage of? The penny stock market is one of the most brutal within the financial markets. It is something that many traders do not understand and those are the people who are continually taken advantage of. At the end of this training, you will be the one who is doing the hunting… not the one being hunted. Any experienced trader will tell you that surviving the financial markets has more to do with psychology than any other aspect. Enter into the penny stock market, and this fact becomes that much more important. Not only do you need to be psychologically confident in yourself, you need to understand all the moving parts and psychology of the penny stock market itself. In order to be successful, you need to have a mindset of confidence. In order to be confident in your ability to survive this dangerous wilderness, you need to understand “how” it works, and “who” the creatures are that make up the environment. This is what the training is all about. The penny stock market is a wilderness; however, it is not a wilderness filled with bunny rabbits and pretty flowers… it is a wilderness filled with wolves and plants filled with thorns. This training is designed to turn you into a lean, mean, penny stock hunting machine. You will have a true mindset of confidence to be successful as you make your way through the wilderness. You will know all the emotions that are found in the wilderness, and, with this knowledge, you will understand how to leverage and use other people’s emotions in your favor. The guide is all about details and in-depth explanations. There are no broad explanations that leave you with the feeling of being incomplete and worst yet, not feeling confident. All the areas and components of the penny stock market are covered step-by-step in a very logical and easy to understand presentation. If you have any questions about any of this course material, pleae do not hesitate to ask by clicking here. Read complete user testimonials here. 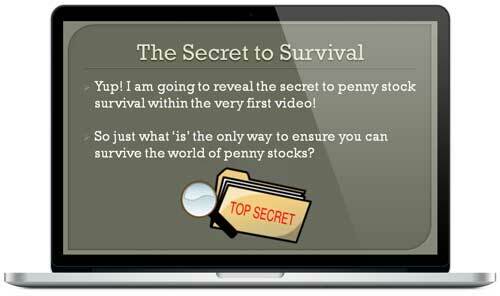 Enroll today and get instant access to the "The Penny Stock Survival Guide" subscription. This is entirely available online with the user name and password you will create during checkout.